Hi there! I’ve got a Nail Of The Day post for you today. And it’s another marine mani! For this mani I painted my nails with Sinful Colors Blue La La (2 coats, pinkies, middle fingers), Revlon 044 Blue Lagoon (2 coats, ring fingers), and Maybelline Colorshow 654 Superpower Blue (2 coats, index fingers, thumbs). 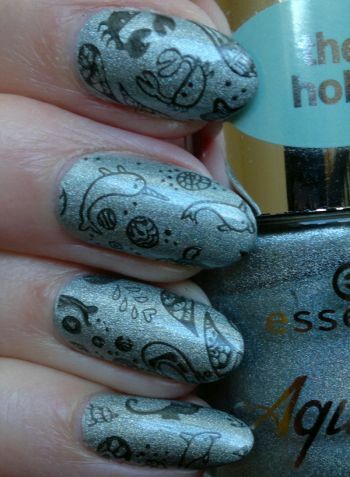 I used MoYou London‘s super cute Doodles 07 stamping plate. 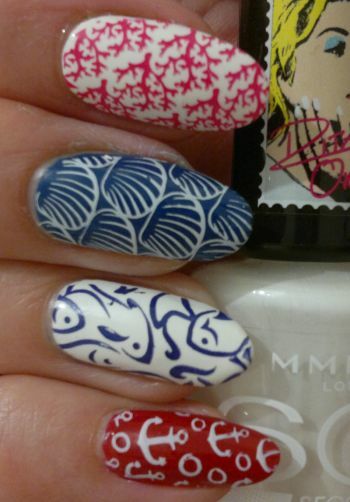 As almost always, I used drugstore polishes as my stamping polishes: Maybelline Colorshow 654 Superpower Blue (pinkies, middle fingers), Orly Snow Cone (index fingers, thumbs), and Revlon 902 Craving Coral (ring fingers). I like this mani. It’s not my best marine mani, but it looks cute, so what’s not to like? Do you like marine manis? Feel free to get in touch. By the way, if you’d like to order from MoYou, you can get 10% off if you order through this link. Hi there! 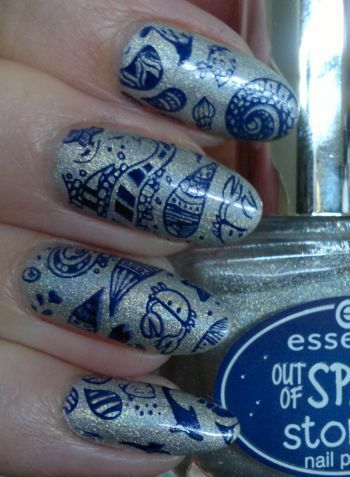 Today’s post is about another mani that I did for the A-Z Nail Art Challenge. 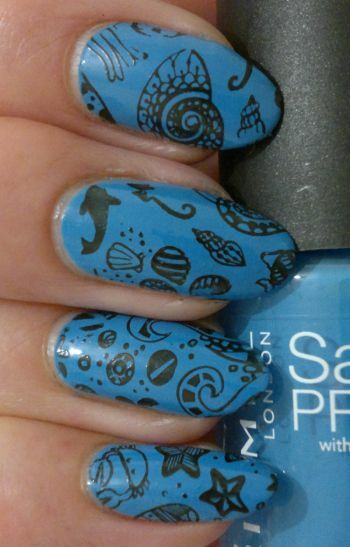 This mani is my Underwater mani. 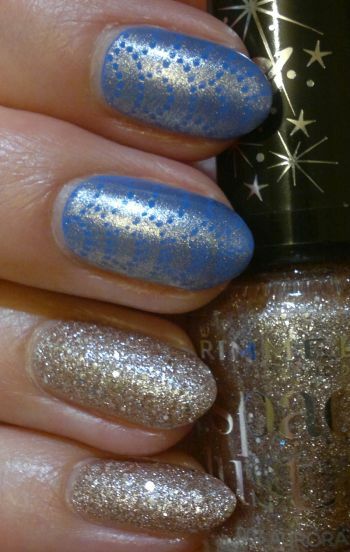 I started by painting my nails with Essence Out Of Space Stories 06 We Will Spock You. This isn’t the greatest silver holo polish, but it does the job. 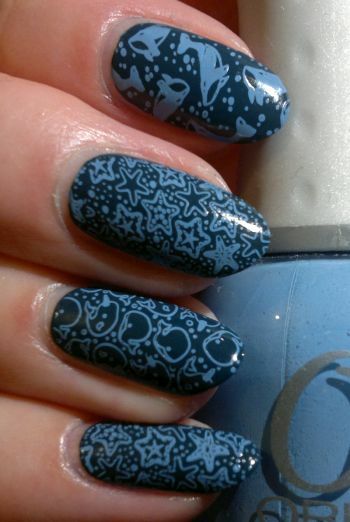 I used MoYou London’s Doodles 07 plate and Filthy Gorgeous Midnight (the dark blue polish I stamped with) to complete this mani. How do you like this mani? Feel free to get in touch. By the way, if you’d like to order from MoYou, you can get 10% off if you order through this link. Hi there! Today’s post is about a mani I did recently. We had a few colleagues from France over at our office. I managed to dress properly (navy-blue suit, red and white striped top), but I couldn’t bring myself to wear plain red nails (yawn). red stamping colour – Revlon 335 Mon Cherry. 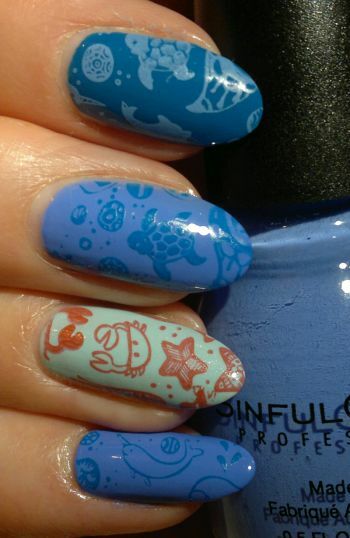 I chose images from three different stamping plates – Pueen 89 (shells), Pueen 91 (fish and corals), and Pueen 96 (anchors). These three stamping plates are part of Pueen’s Buffet Leisure stamping collection! I’m starting the new week with a mani post. I really like how this mani turned out, so let me tell you how I did it. For this mani I painted my nails with Rimmel Salon Pro 636 Hooray Henry. This polish is almost a one-coater. Great quality! The black polish I stamped with is Rimmel Lasting Finish Pro 430 Black Satin. Feel free to comment if you want. And thank you for reading!